Site Selection Magazine announced the Dayton-Kettering area was named to the No. 2 spot in the Governor’s Cup, a list that tracks new and expanded facilities per capita. The project calculates the number of businesses that either invest $1 million, add 20 new jobs, or build 20,000 square feet of new space. 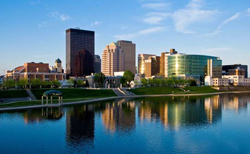 The Dayton area has ranked among the top 10 metropolitans of its size for economic development projects for the past 13 years. According to the Dayton Development Coalition, new jobs committed to the area leapt nearly 80 percent from 2017, and new payroll increased more than $86 million from 2017 – the most in at least seven years.